Fire safety is important, even when you are away from home. Vacations and business travel make hotels and motels our home away from home. It is just as important to be prepared and know what you would do in a hotel/motel emergency as it is in your own home. Find the fire alarms on your floor. Locate the nearest pull stations to active an alarm. If the alarm sounds, leave right away, closing all doors behind you. Use the stairs – never use elevators during a fire. Call 911 to let the fire department know your location. 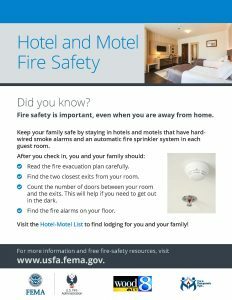 Click here to download the Hotel-Motel Fire Safety flyer located below. 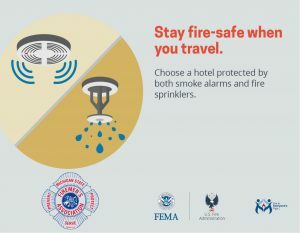 The Michigan State Firemen’s Association encourages you to visit the Hotel-Motel List to find lodging for you and your family that provides safety and security!